Washington DC, 11 October 1987. Affirmation members march in the largest lesbian and gay rights rally to that date, with more than half a million people participating. Affirmation is the story of a struggle for self-acceptance and self-worth. It all began in the 10 to 15 years prior to 1977. During this period many groups of gay Mormons met together at one time or another, principally in Salt Lake City, Los Angeles and at BYU. These groups were generally only gay men meeting secretly. Nearly all of these groups were strictly social organizations, with most of them lasting only a short time. These groups reflected the nature of the times; they were, after all, pre-Stonewall days and gay liberation was almost unknown. Times were not right for a lasting organization. However, many people kept trying, knowing there was a great need for an organization of gay LDS people to help one another. During late 1977 and early 1978, Affirmation was struggling to achieve a firm foundation. The Salt Lake and Dallas groups met only sporadically and the Denver group had dissolved completely. Affirmation was still a one person show, surviving mainly because of Matt Price’s determination and persistence. However, a powerful boost occurred when Paul Mortensen read an article about Affirmation that appeared in the Advocate. Excited about the prospects of establishing a branch in Los Angeles, Paul contacted Matt Price. Then after many letters and phone calls, the Los Angeles group was organized in January 1978. Although only six people attended the first meeting, the Los Angeles Chapter exploded and soon appeared as the leading chapter for Affirmation. Through its influence, chapters appeared in many cities around the country and, later in the year, a network was established to allow cooperation among the various branches. During this time, the Dallas group discontinued as Matt became ill and could no longer be involved. 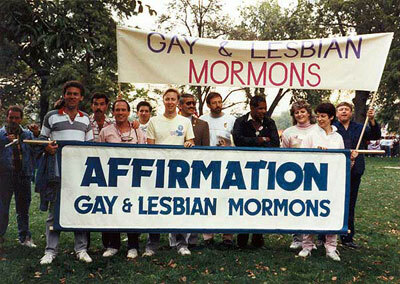 The year 1979 was a year of significant growth for Affirmation and gay LDS people. It was the year that Affirmation decided to proclaim itself. In June of that year, for the first time ever, Gay Mormons marched in a Gay parade in Los Angeles. In September, 14 members participated in the “March on Washington for Gay Rights.” Now there would never be any turning back. It was the first national mainstream coverage Gay Mormons had ever received and it raised our goals and spirits. August and September of 1979 saw the beginning of chapter in San Francisco and Washington D.C. Robert Axelson in San Francisco and John Laurent in DC saw the Advocate ad and with help of Los Angeles began chapters in their cities. San Francisco took off with the same energy as Los Angeles and it soon became a driving force in the national organization. The December 1979 meeting marked the real beginning of Affirmation as a national organization. For the first time, the individual groups from across the nation met to coordinate goals and unite for the common purpose of supporting and helping each other. Since then, many chapters of Affirmation have been organized. There has been a continuous national organization since 1979, meeting each year in general conference and three to four times a year for leadership meetings. Throughout the years, many dedicated people have contributed much to this organization. Since Affirmation began, thousands of people have been touched and helped. So many have been lifted from despair and isolation and have been able at least to affirm their self-worth. The Lord has blessed Affirmation and the people who have sought it out. At one time the original historical documents and records of the Affirmation group were contributed to ONE Institute in Los Angeles. I don’t see them listed there. Do you know where your earliest historical records are held? Is there any way we can get a listing of each Affirmation Conference since the beginning here on the website?? It would be great to see our history and which cities have hosted conferences!